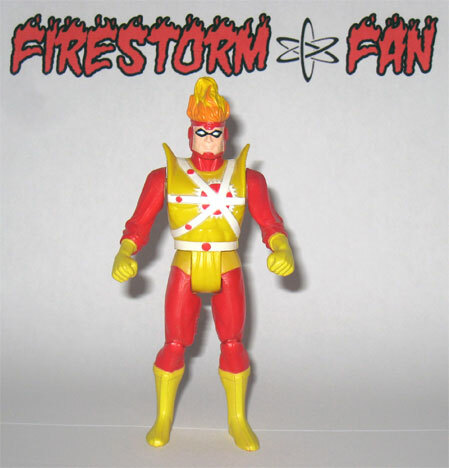 Probably the most celebrated piece of Firestorm memorabilia is the 1985 Super Powers Collection Firestorm action figure. While there have been several figures produced since then, this one holds a special place in many fans hearts. If you collected comics or toys in the mid-1980s, then you probably owned some of the popular Super Powers line of action figures. Even if you just read Marvel Comics (and therefore were probably more interested in the “Secret Wars” action figures from Mattel at the time), you most likely had seen some of the Super Powers figures in the stores. One of the main reasons that the Super Powers figures were so successful was because they adhered to the characters comic book likeness so closely. Another reason for the line’s popularity was the inclusion of popular characters and some relatively unknown heroes. This mixture proved to be popular with comic book fans and kids alike. For DC, Firestorm happened to be the right character at the right time. His monthly comic was already selling well and he’d just started appearing on the Super Friends cartoon. He was definitely a character on the rise. The action figure helped push his popularity even further. For me as a fan of Firestorm, having an action figure meant that the character had finally “made it”. A monthly comic, on TV, and now an action figure! Firestorm was in the big time! This figure was really the first tangible piece of Firestorm merchandise, outside of the comic itself. Additionally, the figure looked great. He actually looked like Firestorm! Well… maybe the shoulder pads weren’t perfect, but everything else was spot on. That’s impressive given that many action figures back then didn’t resemble the source material much at all. So the strong resemblance combined with this being the first Firestorm toy made this figure very special to Firestorm fans. Here is a picture of the Super Powers Firestorm still on the card. I’ve seen it advertised recently on the card for as much as $95. Here is an example of the back of the card. Apparently this is a French version. I found this over at Toytraderz.com. For my full coverage of the back of the card, please click here. Each of the Super Powers figures had a hidden gimmick, referred to as “Power Action”. 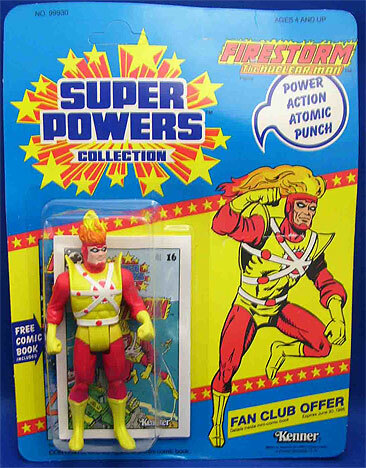 In Firestorm’s case it was a “Power Action Atomic Punch”. By squeezing his legs together, his arms would move up and down. This was supposed to simulate Firestorm punching out his enemies. While the gimmick was nice (especially since it didn’t disrupt the appearance of the figure), it really wasn’t very relevant to the character. Firestorm is not necessarily known for punching out his opponents. To see the Power Action Atomic Punch in action, check out the Super Powers Firestorm site done by Cool Toy Review. Go to the bottom of the page and roll over the photo to see Firestorm in action. The Super Powers action figures were produced by Kenner, who was a giant in the action figure market in the early 1980s thanks to the success of their Star Wars line. So it’s no surprise that the Super Powers figures were done in a smaller scale like the Star Wars figures. 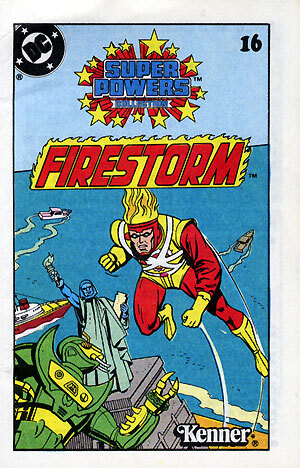 Firestorm stood a whopping 4.75 inches (to the tip of his flaming hair). Because of this the Super Powers Firestorm looks rather small compared to his “younger brothers” produced within the past few years by DC Direct and Mattel DC Universe Classics. More on the “younger brothers” in future posts. The first two waves of Super Powers action figures each came with a mini-comic book starring that particular character. These comics were 4.5 inches by 2.75 inches, and had 13 pages of story. Firestorm’s mini-comic (cover and a page pictured below) featured our hot-headed hero along with Green Arrow doing battle with the villainous Mantis. Not so coincidentally, both Green Arrow and Mantis had figures released at the same time as Firestorm. In the story, Mantis had stolen the abilities of Superman, making him quite the powerful foe. Firestorm ultimately defeated the Mantis by cleverly turning the Statue of Liberty into Kryptonite (a weakness Mantis shared while in possession of Superman’s powers). 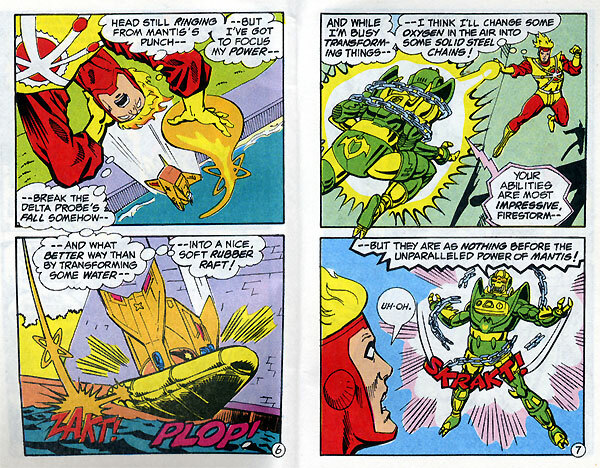 Meanwhile, Firestorm appeared in three other Super Powers mini-comics – Martian Manhunter, Darkseid, and the Parademons. Throughout these other Firestorm’s mini-comic appearances, his primary function was to crack poor jokes and use his transmutation powers to rescue people. Click here to see all the Super Powers mini-comic covers. For my complete coverage of the Super Powers mini-comics, please click here. There were a total of 33 figures produced across three waves for the Super Powers Collection action figure line. Click here to see all the figures. In 1984 Kenner launched the first wave with 12 figures that featured well known characters like Batman, Superman, and Wonder Woman. The first wave was well received, so in 1985 Kenner produced a second wave. This time they produced 12 figures, featuring some lesser known characters such as Firestorm, Doctor Fate, Red Tornado, Martian Manhunter, and many New Gods characters. A third wave of figures was released in 1986 and proved to be the final wave. Here is something I didn’t know until I did research for this post. There was an additionally planned, yet unproduced Firestorm action figure for the Super Powers Collection. I had no idea! Turns out that Kenner was working on several figures for release after the third wave. You can read all about it, see presentation artwork, and mock-up figures by clicking here. 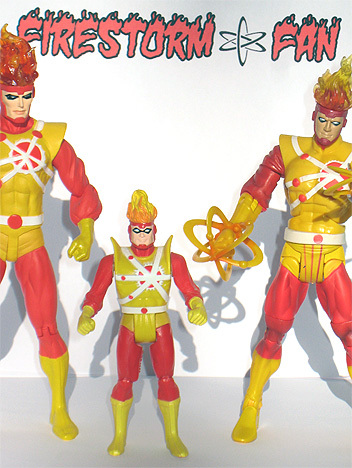 The unproduced Firestorm figure was to be part of the new “Power Plus” line of the Super Powers Collection. The Power Plus line was planned to be a separate deluxe set of figures that used existing body parts with new torsos that had light-ups, interchangeable parts, or larger mechanisms. 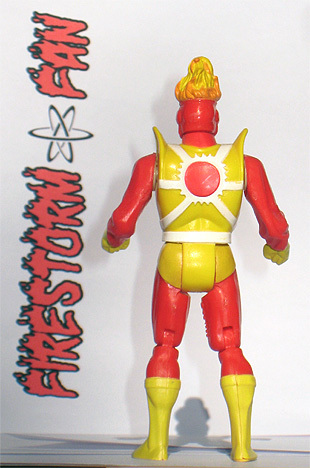 The Firestorm figure was labeled, “Power Plus Fire Flash Firestorm”. 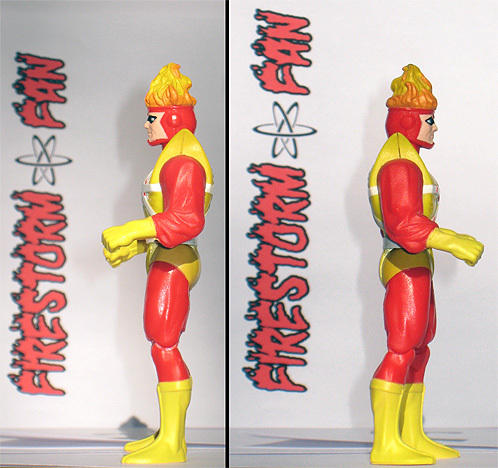 Based upon the conceptual art, it appears this Firestorm figure was going to feature light-up translucent flaming arms, a redesigned torso, and a translucent flaming cape on his back. Check out the links below for details, conceptual art, and some of the prototype pieces. While I’m not necessarily thrilled about the look of the Power Plus Firestorm figure, I still can’t help wishing it was in my collection. We were denied a piece of our childhood that may have become one of our most treasured possessions! To tie in with each wave of the figures, a DC Comics mini-series was produced for the separate waves, each mini-series centering on the figures spotlighted in the corresponding wave. Firestorm was featured in the second six-issue mini-series, as well as the third four-issue mini-series. 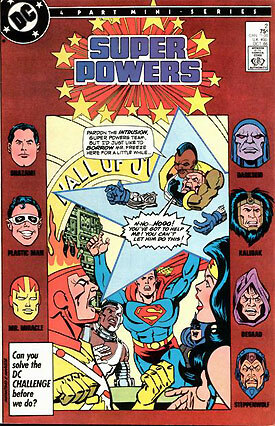 The second Super Powers mini-series series was cover dated September 1985-February 1986. The series was written by Paul Kupperberg and Jack Kirby, with art by Kirby. For me personally, this was the first of the Super Powers mini-series I read. I absolutely ate this series up. Loved it! I do remember being slightly confused about Doctor Fate from Earth-2 hanging out with the heroes of Earth-1, but it didn’t bother me for long. I mean c’mon, Jack Kirby drawing Firestorm!?!?! It doesn’t get much cooler than that. 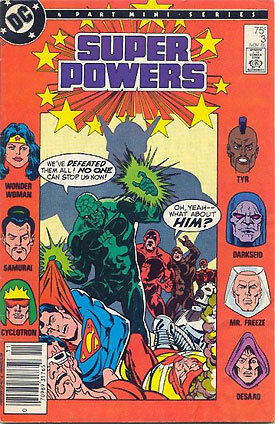 The third Super Powers mini-series was cover dated September 1986-December 1986. Again the series was written by Paul Kupperberg, but this time the art was by Carmine Infantino. Dude, Carmine-freakin’-Infantino! Regardless of whether you liked these mini-series or not, you gotta respect these Silver Age giants who drew these fun books! On the cover of issue #3, I love to see Firestorm’s flaming hair has been reduced to a smolder. Too funny! Of course an article about the Super Powers phenomena wouldn’t be complete without mentioning the Super Friends/Super Powers cartoon television series. I won’t go into any great depth here because I’ll do that in a future post, but Firestorm first appeared in the premiere episode of the 1984 Super Friends season (September 1984). 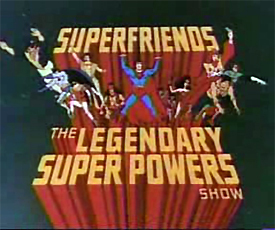 This is noteworthy because this was also the first episode of the retooled Super Friends, renamed for the 1984 season “Super Friends: The Legendary Super Powers Show“. 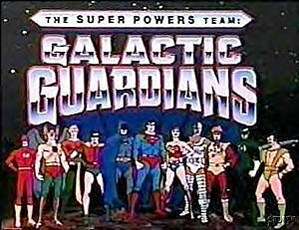 The following year also featured Firestorm, but this time they had completely embraced the Super Powers branding and retitled the series, “Super Powers Team: Galactic Guardians“. If you noticed the years there, Firestorm actually appeared in the cartoon approximately a year before his action figure was released. So that’s always left me wondering, which came first… the idea to put Firestorm in the Super Friends cartoon, or the plan to produce an action figure for Firestorm in the Super Powers line? 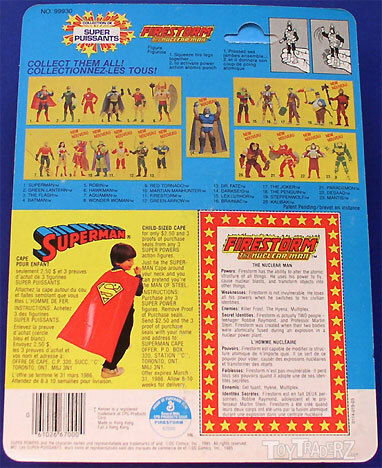 So there you have it… the Super Powers Collection Firestorm. I promise future posts won’t be nearly this long. I just felt this particular piece of memorabilia deserved the extra attention. Posted in: Cartoons, Comic books, Firestorm #01: Original (Ronnie/Martin), Super Powers Collection, Toys. ← Why a Firestorm Blog? Great write-up! Firestorm is definitely one of the coolest looking of the Super Powers figures. The Super Powers toys still hold up amazingly well for the most part. For the most part, they really capture the iconic “essence” of the DC heroes, in all their Four Color glory. Firestorm is a great example of the design strength of the Super Powers Collection. He ranks right up there with Green Lantern, Aquaman, Hawkman (a-hem! ), Martian Manhunter, and Doctor Fate as still holding up today as a worthy plaything. Much like the SP Hawkman holds a special place in my geek-heart (as well as on my toyshelf), I can easily understand how you feel about the Firestorm fig. I loved the Super Powers toys. As a comic book fan, I also appreciated that non-Super-Friends characters like Martian Manhunter had figures as part of the line. While some of the action features of the figures made little sense (Like the one you mentioned, Firestorm’s Atomic Punch. Seriously, has Firestorm ever even punched anyone? ), the figures in the line were well-made. I also liked that the New Gods got so much face time in the line. I like the new site, Shag. While I have made jokes about your love of Firestorm, I actually think he’s a very cool hero. I look forward to more posts. Indeed, my Super Powers Firestorm does hold a special place in my heart! This is a fantastic overview, and I’m very excited about this blog. I’ve always been fond of Firestorm and, like you, I’m a bit disappointed by the lack of coverage he earns on the web. He’s certainly one of the best designed superheroes I’ve ever seen in action on the page. I look forward to what you’ll have to offer us in the weeks to come. That “French” packaging is actually Canadian. Everything here has to be bilingual. Superpowers was and always will be my favorite toy-line! My only gripe is that they dident get to make more females like say Black Canary, Zatanna, Barda, or Hawkgirl. But man….I have sooo many good child-hood memories from these figures. I still have them all and still enjoy them! Just found one of the Kenner figures of Firestorm. Top of the card is torn and has water damage but the unit has not been removed. Cool readin some info on it. Wow, great site, man. Love all the detail you put into Firestorm’s history. Any chance you’ll be adding Firestorm II to the mix or is this purely Firestorm I? Hey Ryan! Thanks for stopping by. If you look in the right hand navigation there is a section for categories. You can find more “toys” coverage with those. You can also find coverage of the 10 different incarnations of Firestorm. Thanks again! Or if you already had that post, put a permanent link to it on the front page or sidebar somewhere. 😉 Please? @Nate – Good idea! When I’ve got some time, I might just have to compile a Merch post! !